Rich with descriptions of early spring in Talasia, Mississippi, Unraveled takes place in 1954. With the folksy charm and wisdom one can anticipate from the author, we meet Alice and Paul, who have recently lost the baby they had eagerly hoped for to miscarriage. It is fiction, but is still helpful in many ways to those who have had miscarriages as well as those who love them. Alice and Paul are both very likable, even as they grieve in their own way for their child. Life is different than either of them had envisioned; Paul is running his parent’s furniture store and Alice is a teacher on leave until she can return to work after her miscarriage. Alice is grieving hard, having had the miscarriage only weeks earlier. Her doctor has assured them that grieving is unique to each with regards to intensity and time. Alice finally chose to go to the sewing group at church with her best friend, JayNell. She learns that the next project they will do is to crochet little caps for the babies at the local hospital and doesn’t think she can do it, but will finish the prayer shawl she started weeks earlier. Alice hears comments from those who mean well but simply don’t know what the best thing is to say to show their love. It is out of desperation, finally, that Alice attends the first meeting of a support group for ladies who have miscarried. The characters are very likable in that it is easy for the reader to become invested in them. They are also believable, especially considering that most people didn’t speak of miscarriage in those years. Alice’s emotions seem very normal to this reader, as do Paul’s seem to be over the loss, as men and women show feelings differently. JayNell is a good friend, also. Alice hears many things in the group she goes to. It seems there isn’t anyone, however, with whom Alice feels she can share her deepest fears with, until she hears a still, small voice. I like how well Alice can speak, or at least think through descriptions of how she is feeling, especially describing how there is a black pit inside that slowly consumes more and more of her. One of the things I love is how the author shows the prayers of the individuals. I also love the symbolism, especially the scene with the blue jay that refused to be frightened away by Alice’s knocking on the window, and the unraveled row of crochet. While it is a novel of grief and changes, a tiny flicker of hope is lit that the future can be different. There were moments that I feared what would happen to this precious young woman, and hoped that a lifeline she would grab onto would come to her quickly. I highly recommend this beautifully written novel, especially to those who appreciate well-written Christian women’s fiction, those who want to learn more about the grieving experienced by one who loses a child to miscarriage. From a grateful heart: I was given this eBook by Book Fun (The Book Club Network) and here is my honest review. Another great book by Jo Huddleston. I love her books always a greats story and can always take something from them for a life lesson. Characters are well developed. I could relate to this story and the characters being i have loss a baby. In the story Alice has loss a baby and she spirals into a depression over it. Emotionally and physically drained she just can't cope. She is ruing her relationship with friends and her husband. She can't seem to get out of the grieving stage and move on with her life. Even to the point of wondering what is God doing? Her best friend tries to get her back involved with things at church with a sewing circle. But the next project is something to do with babies and that throws her off. Her husband doesn't know where to turn anymore and who he can talk too. He reaches out to her friend and a busy body neighbors sees him at the house and starts gossip. Of all places she takes it to the church during the sewing group. Alice is so distraught with things in her life she thinks what the lady is saying is true. Will she believe her friend and her husband? Or will this just be another thing to push her over the edge. Can she come back and move on with her life? A wonderful must read story. 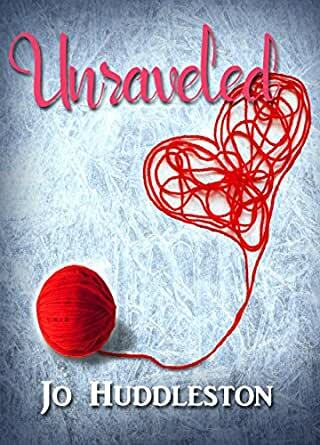 Unraveled deals with depression after a miscarriage and how it affects one’s life as well as family and friends. Changing emotions are excellently portrayed and are believable and realistic. My favorite characters are Paul, Alice’s husband, and her best friend JayNell. Their support, love and devotion to Alice are heartwarming. I appreciate the spiritual elements of the story-line and how love and faith in God during difficult times, as well as good times, is very important. A heartwarming story. What intrigued me about this book was the picture on the front cover. I love everything you can do with yarn, crochet knit etc. I do knit for local charities, the newborn program is one of my favorite. Love the title and how it's a symbol for the story inside. This story is about Alice and she's having a hard time recovering from the miscarriage. She's a young child teacher who's not returned to work yet. Paul, her husband is beside himself trying to help her. With the aid of her best friend who's a nurse they come up with a few suggestions to try. Some of those backfire. So many scriptures are quoted to help Alice heal. You never think by the end that she'd get over her guilt of it being her fault or even blaming God for everything. Really enjoyed this story and learning of all the resources available to others who suffer. Love all the small things that do matter from her husband. Love the style and ease of explaining what the scriptures mean in plain English. Can't wait for more from this author. Author bio at the end along with highlighted other works by the author. This is another enjoyable book by Jo Huddleston. The book is not overly long, and an easy read, but the plot is what draws you in. I will not give away any information. You can read the preview for yourselves. Just let me say, it's a new storyline for me and I enjoyed it. It will have you thinking of things you probably haven't thought much about unless you've been in the same situation. The editing was pretty good. In all, a little less than a dozen errors both word and punctuation but mostly word errors. I say this because a poorly edited book can ruin a perfectly good story. This will not detract from your enjoyment. I reviewed this book of my own free will by asking for a copy to read and review through bookfun.org.